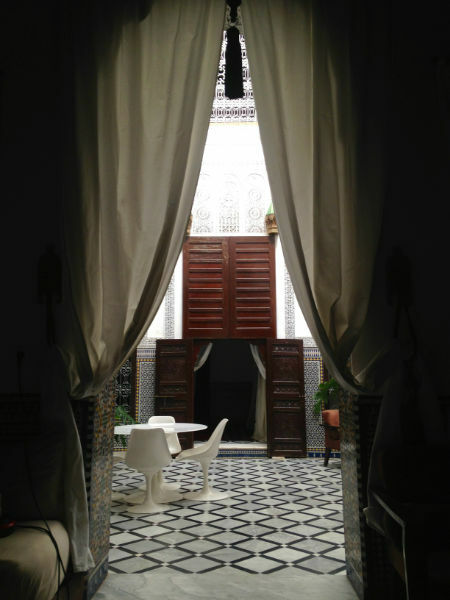 Riad Tizwa Fes Location. 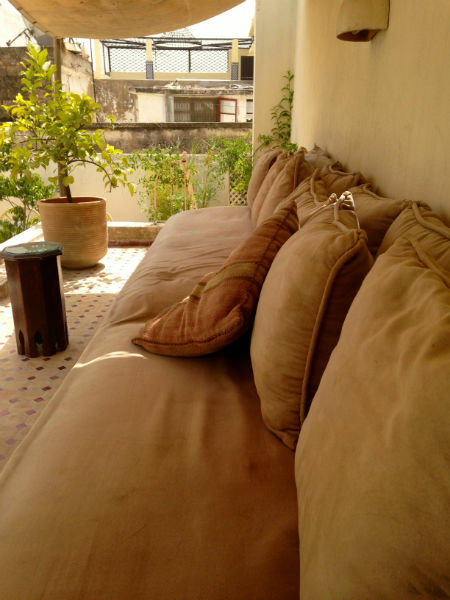 Book Riad Tizwa Fes Today with Hip Morocco - Holiday Accommodation in Fez, Morocco. 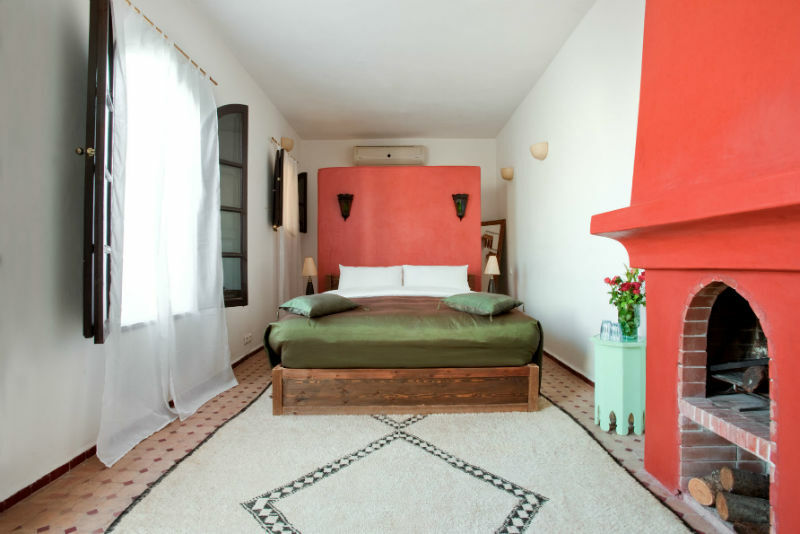 "The design ethos is modern and crisp, using the best fabrics and Moroccan craftwork"
A stylish, calm sanctuary Riad Tizwa Fes is located in what is quite simply the best area of the medina, Batha. 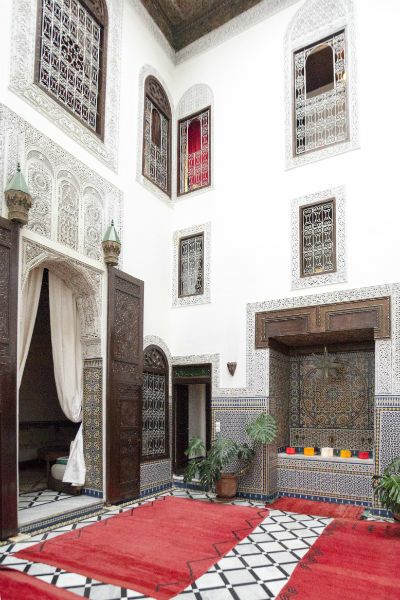 Situated only 50 metres from car access, the house is both easy to find and simple to get to, leaving you to discover the beautiful UNESCO world heritage protected walled old town. 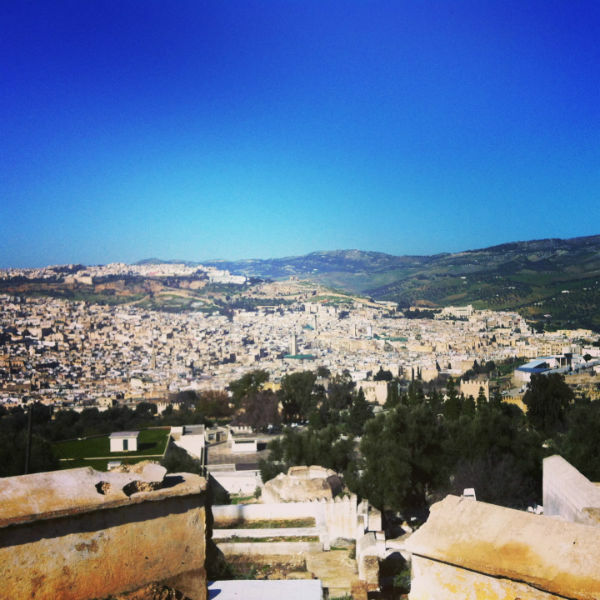 The wonder of the medieval souks awaits. 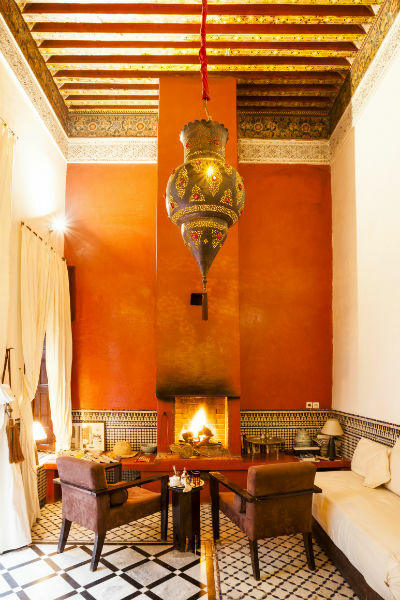 A spectacular traditional Faisian Dar, Riad Tizwa has been painstakingly restored and stylishly decorated blending the age old traditions of Moroccan architecture with 21st century comfort. 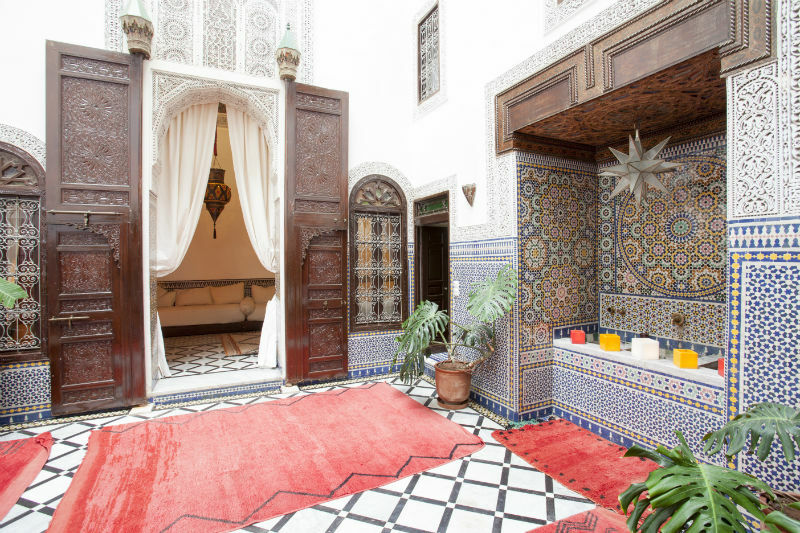 Riad Tizwa Fes offers a chic and luxurious home within five minutes walk of Bab Boujeloud, the main entrance of the souk. With ceilings heights of more than 5 metres and several rooms over 9 metres in length - this is palatial living. 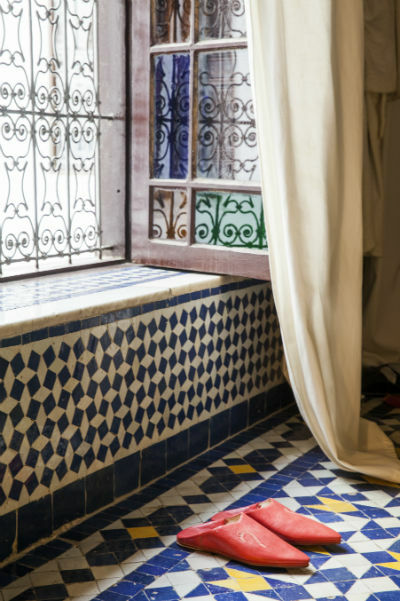 The design ethos is modern and crisp, using the best fabrics and Moroccan craftwork. Our bedrooms are ensuite, each has an i-pod docking station and high quality linens with luxury duvets. 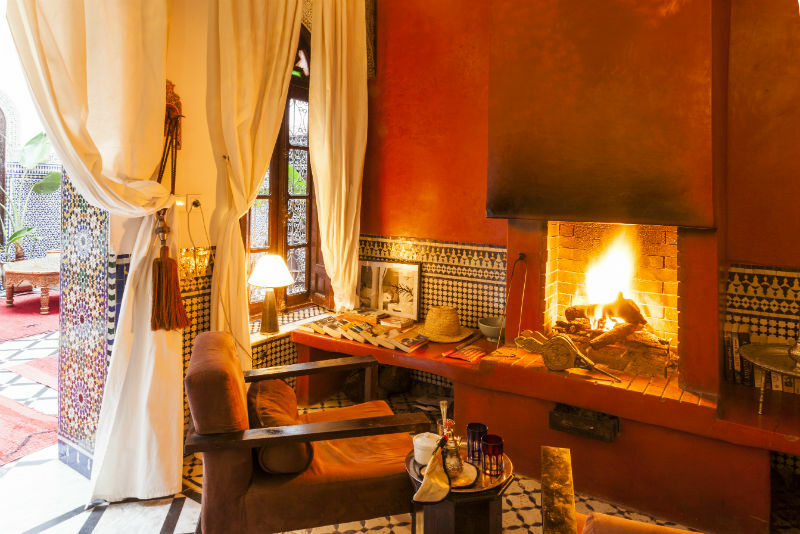 Views from the splendid terrace are far and wide, looking down across the roof tops of the Medina and out through to the middle Atlas mountains. 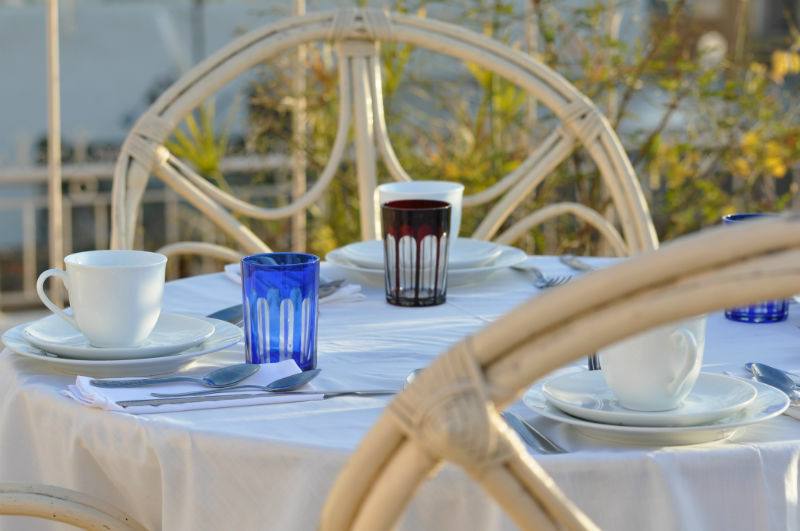 Perfect for alfresco dining with several places to eat, the terrace also has sun loungers and places to sit in the shade. Delicious freshly made breakfasts are served whenever you are ready for them, there are no set meal times. 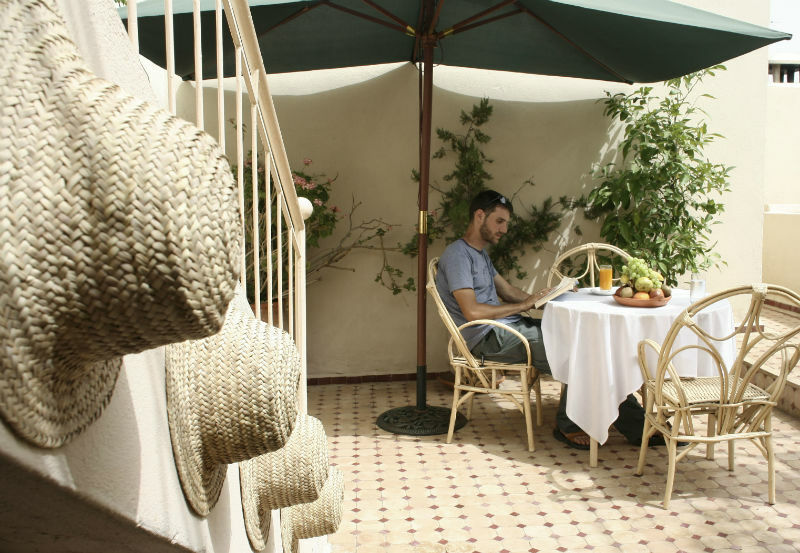 Our friendly and attentive staff are there to ensure you feel at home and have everything you need to make sure your stay in Fes is memorable. 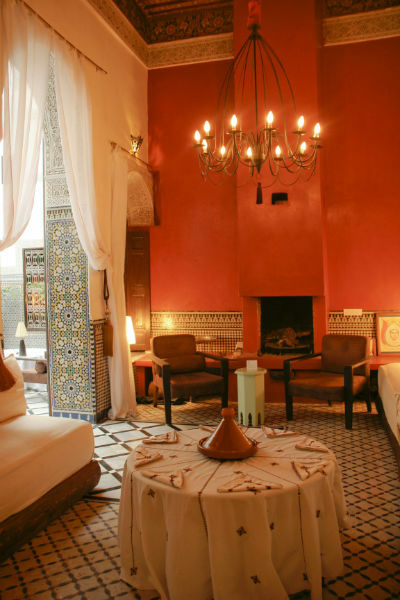 We do not currently have any recommendations from this riad, however, there are many fantastic places to eat in Morocco. 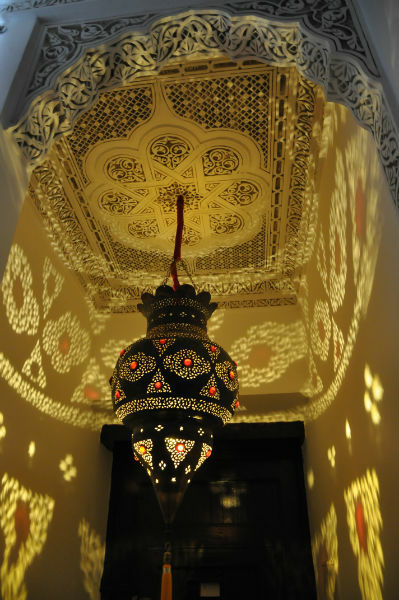 Essaouira: We are currently updating the list of local restaurants for each region. 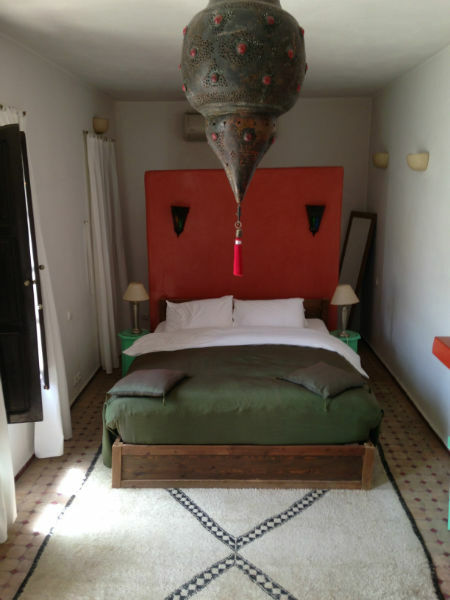 For now in Essaouira look at the following. 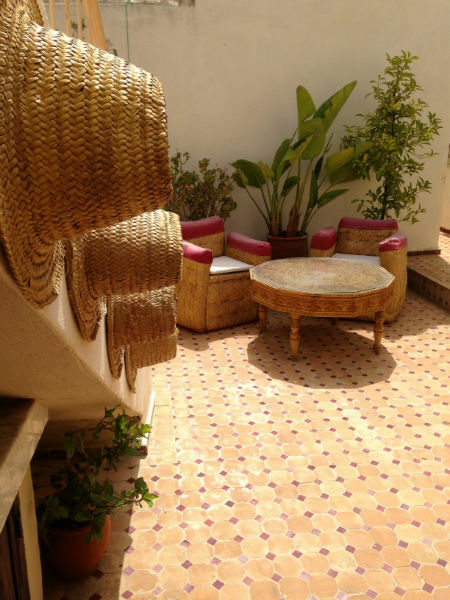 Elizir: Rue de Agadir. The best place in town, not far from the main street. The entrance resembles a classy junkshop. 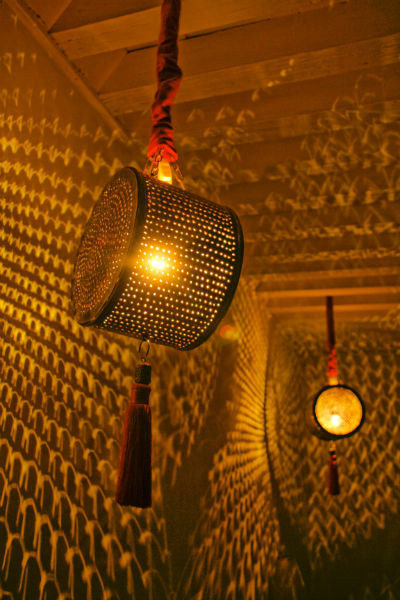 The entire restaurant is decorated beautifully, a really uniqueplace. Oriental classics with an Italian flavour. The service is excellent. Doors open at 8pm and there may be queues. Triskala Café: Rue Touahen.The décor; 60s furniture on the wall, multicolour lighting. Definitely not the type of place you would expect to find in Essaouira. 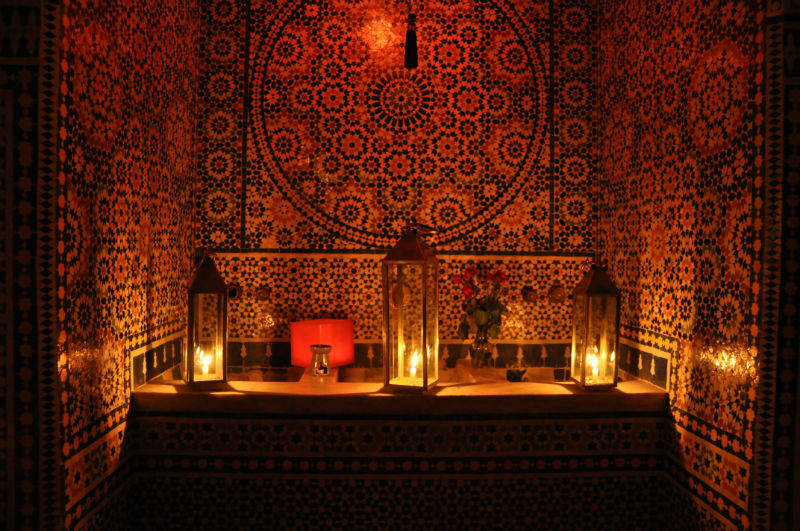 The food is a mix of French and Moroccan. Rated no.2 on Tripadvisor. 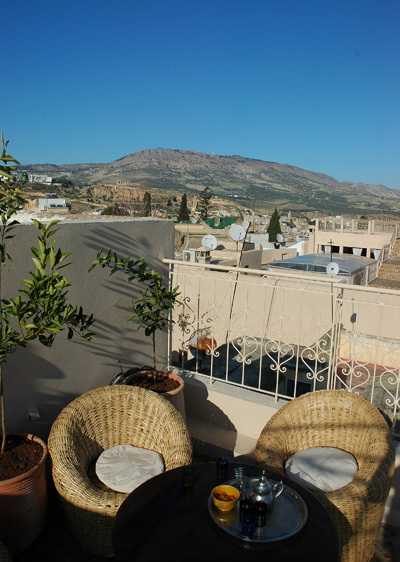 Restaurant El-Minzah: You can eat outside on the terrace of this popular restaurant which faces the ramparts. The menu features a good selection of international dishes with a good selection of fish. Restaurant Ferdaouss: Rue Abd Essalam Labadi. 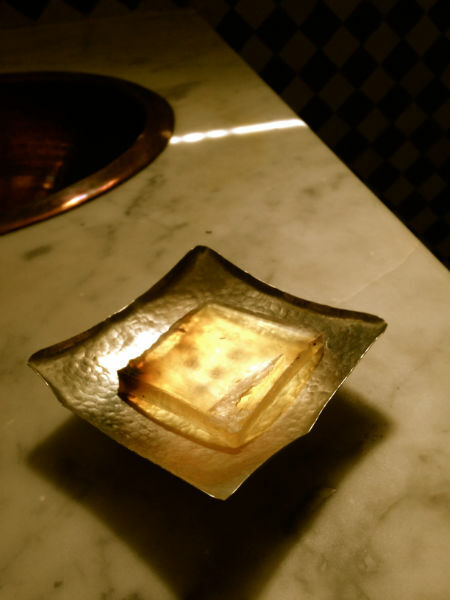 The food is unfussy and excellent. 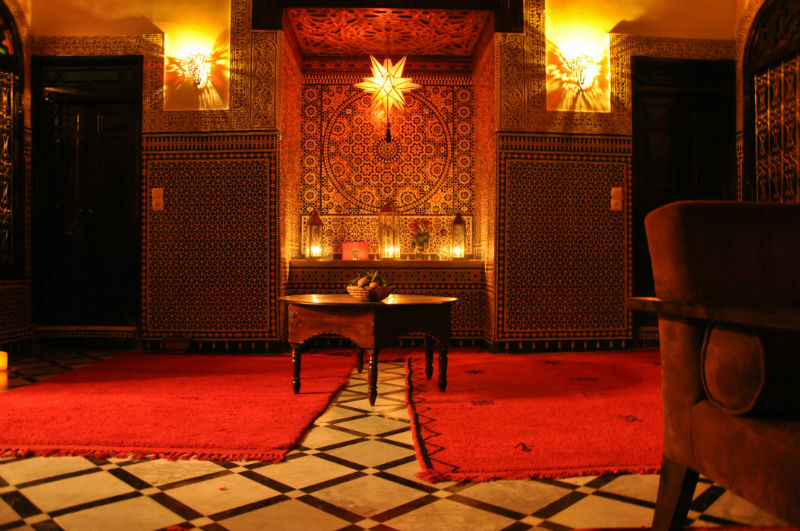 A delightful restaurant, that serves traditional Moroccan food, with an innovative take on traditional recipes. This lovely suite of rooms on the first floor has a Kingsize four-poster bed, with its own fireplace and reversible air conditioning. 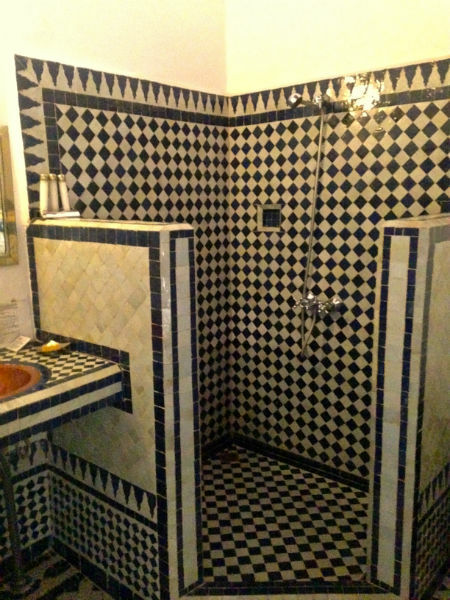 A private staircase leads to a full shower and dressing room. 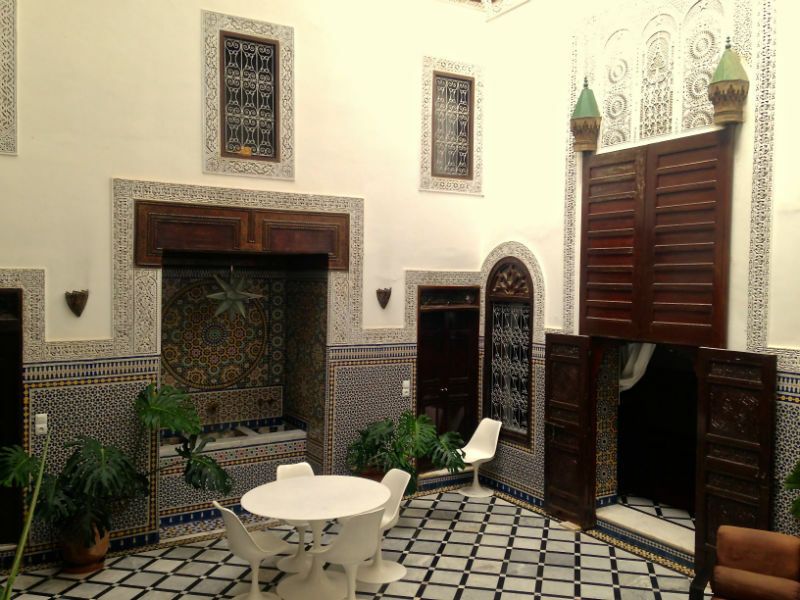 This grand room sits on the first floor overlooking the courtyard. 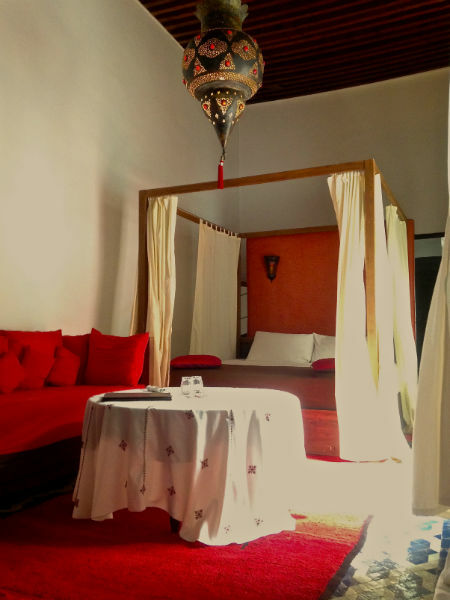 The traditional wooden ceiling towers metres above the beautiful four poster-bed and walk in dressing area.The room benefits from a full length bath, private toilet and wonderful stained glass. 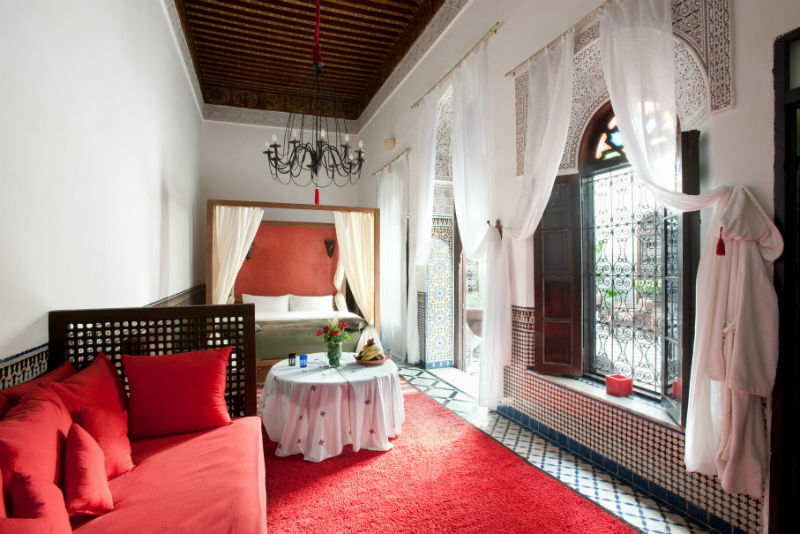 A lovely suite of rooms; the principal being a large double bedroom over looking the courtyard from the first floor. 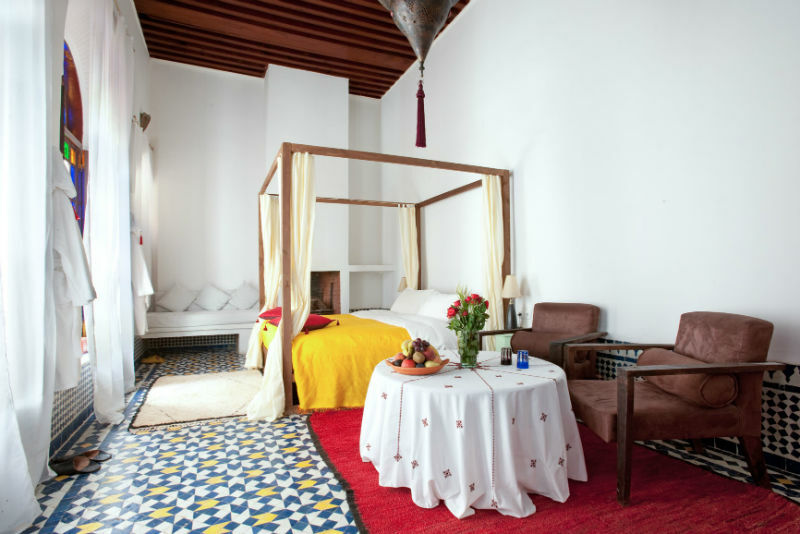 It has a shower room and a dressing room off the main bedroom, reversible air-conditioning and beautiful traditional Moroccan gelize tilework. 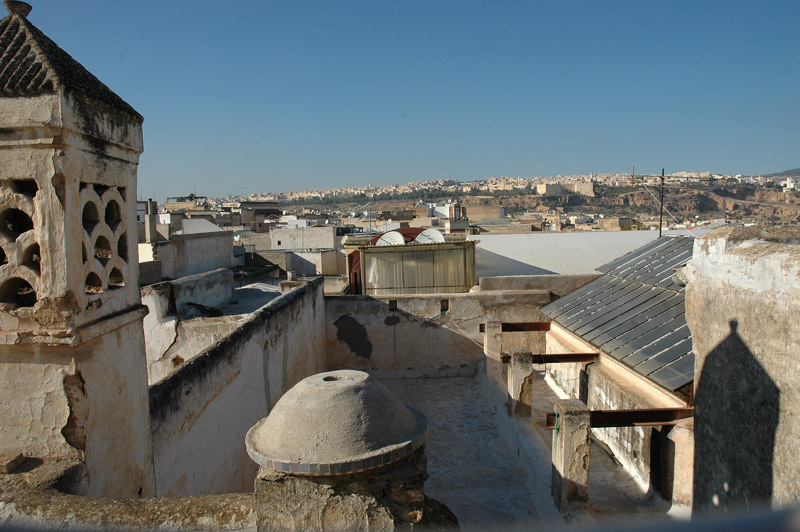 A vast room located on the roof terrace, which makes it feel slightly more private. It is light and bright and has an ensuite bathroom. 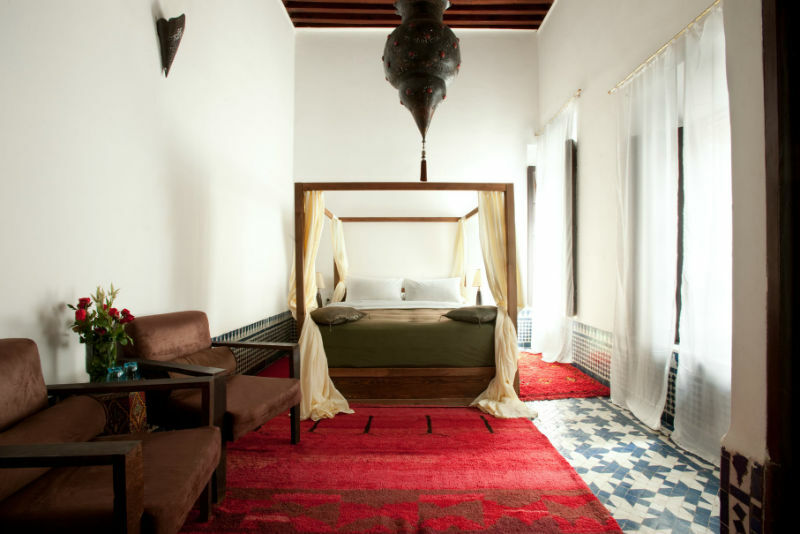 The 4 poster bed is set against a deep red tadelakt wall concealing a dressing area. There is reversible air con as well as an open fireplace. 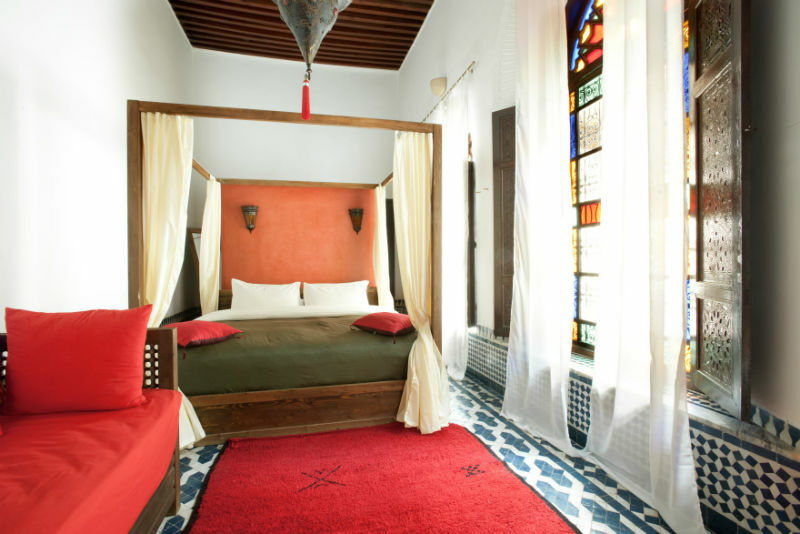 This vast palatial bedroom, just off the courtyard forms much of one whole side of the Riad. 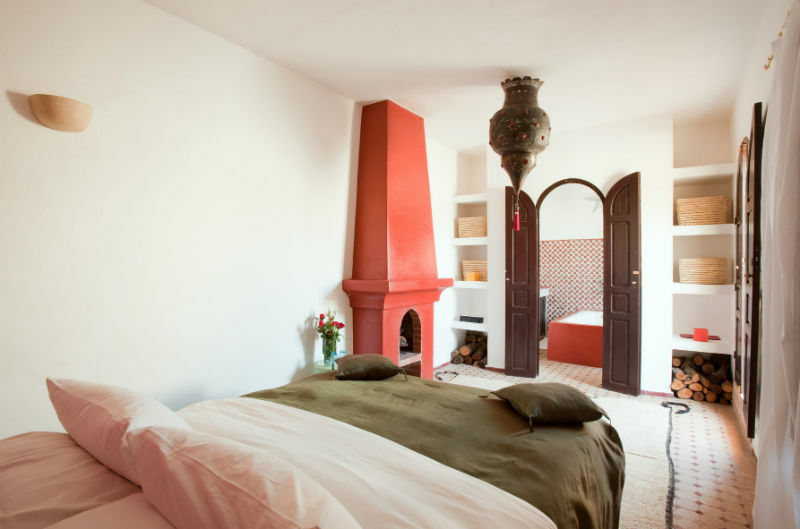 It is ensuite with a walk in shower room and has a beautiful traditional wooden ceiling and gelize work. 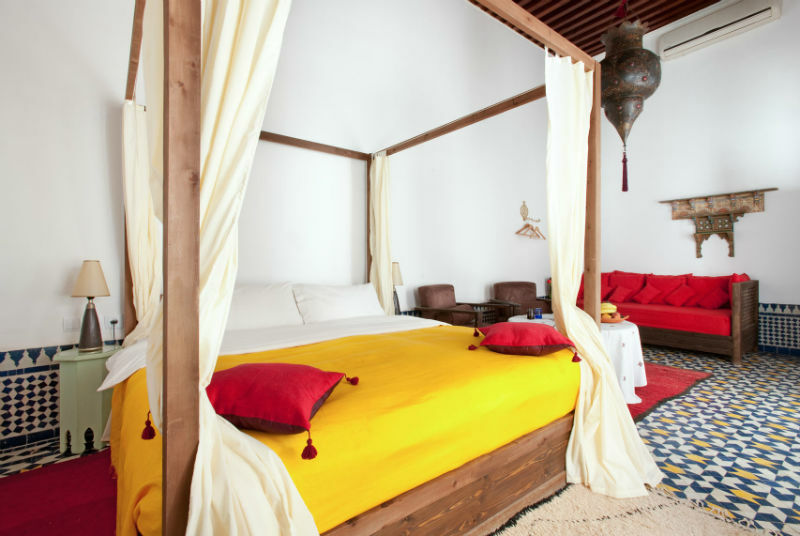 With a four-poster bed this is one of the grandest rooms in the riad. 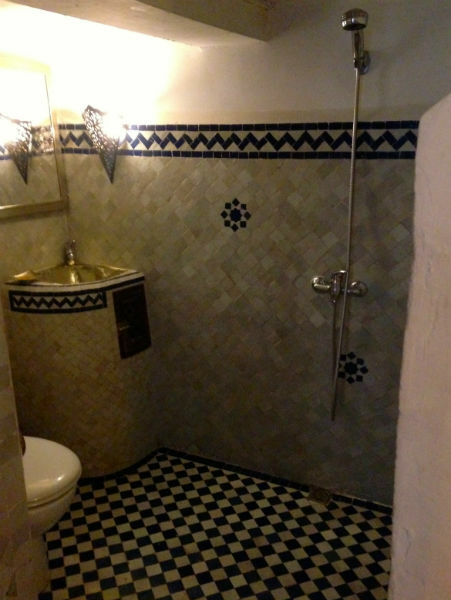 Rooms 7 and 8 are linked via a small corridor, and both share the same bathroom. 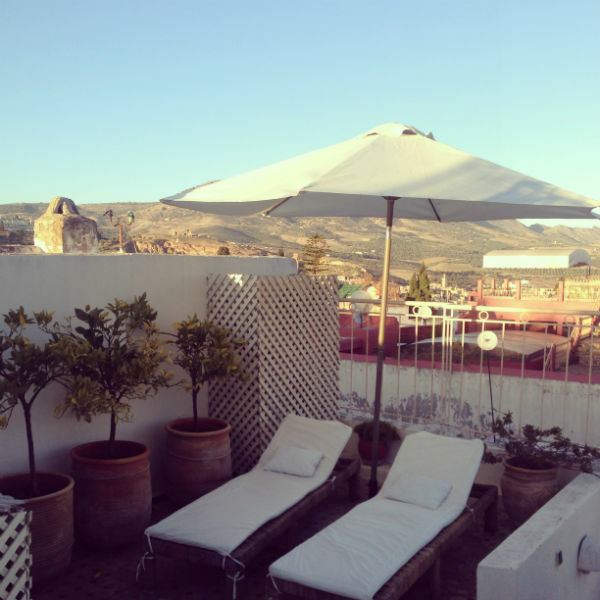 Both rooms are very cozy, and are situated on the mezzanine floor overlooking the courtyard. 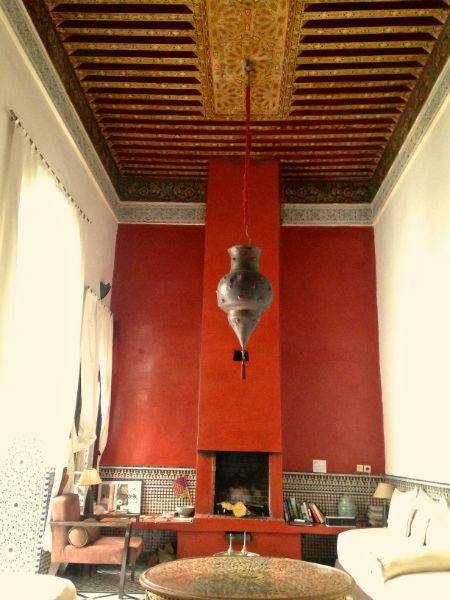 They have a traditional wooden ceiling and particularly fine zelige (Moroccan mosaic floor). 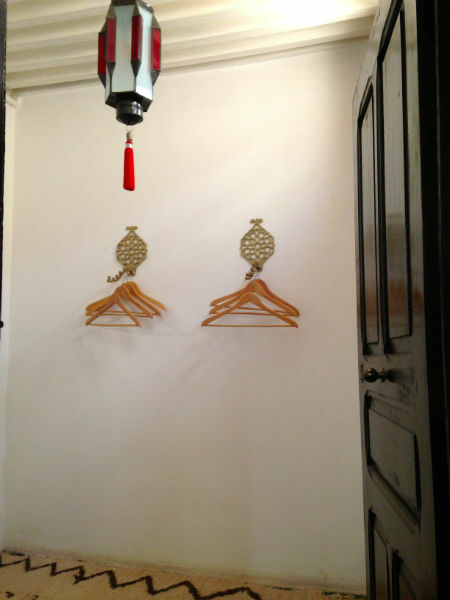 These rooms are suitable for 3 adults or 2 adults and 2 children. 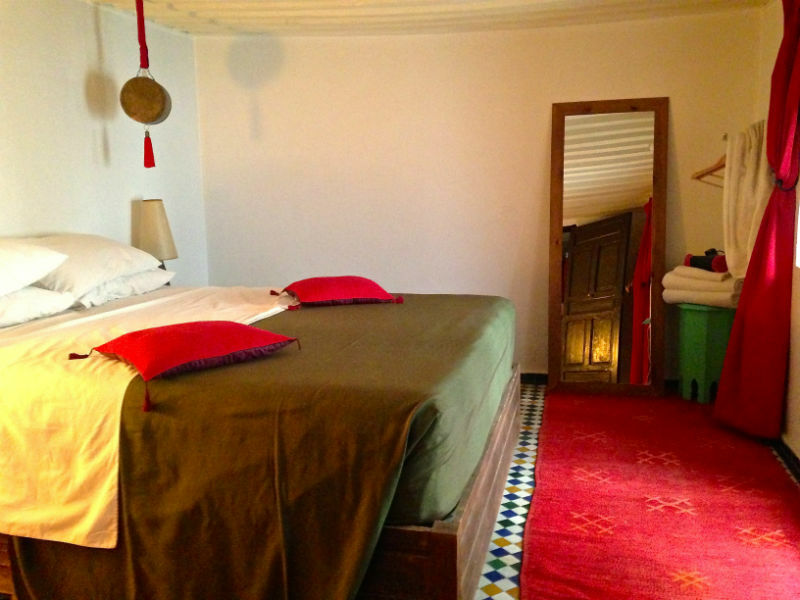 The base rate price at Riad Tizwa Fes is in pounds, euros, or Moroccan dirhams and exchange rates are approximate.